Discussion in 'Plumbing and Central Heating' started by HenryGregory, 13 Feb 2019. I have been in my new build for around 6 months now. Have noticed a musty smell once I have used the shower. Have checked the sealant around the tiles, all looks to be good. Took the side off of the bath and other than piles of builder cr*p the builders had left chucked under the tub, I could not see any moisture. Some wood panneling behind the plasterboard looked moist to me from the dark brown colour, but to the touch, felt dry. You can just make it out at the bottom of the green plasterboard here. Other than that, it would seem the plug pipe goes along, and then connects to another pipe which is higher up. I am thinking that this is obviously going to allow water to sit here, and maybe this would be the cause of the smell I am getting. Can anyone tell me if I might be right in my thinking? Any ideas would be great. I am no expert, but I cannot see that this has been plumbed in a way that would allow dirty water to fully flow away from the bath. Maybe this is intentional to stop back flow if there was a blockage? Water is supposed to stay in the this section of pipe - it's called a trap and the water in it prevent air from the sewer venting into your bathroom via the plughole. It might be worth checking that the trap is actually holding water - dip a pencil through the plughole to the bottom of the trap once the bat has drained and check that it's wet. Can't comment on the 'dark' timber - it's not clear enough to really make anything out. 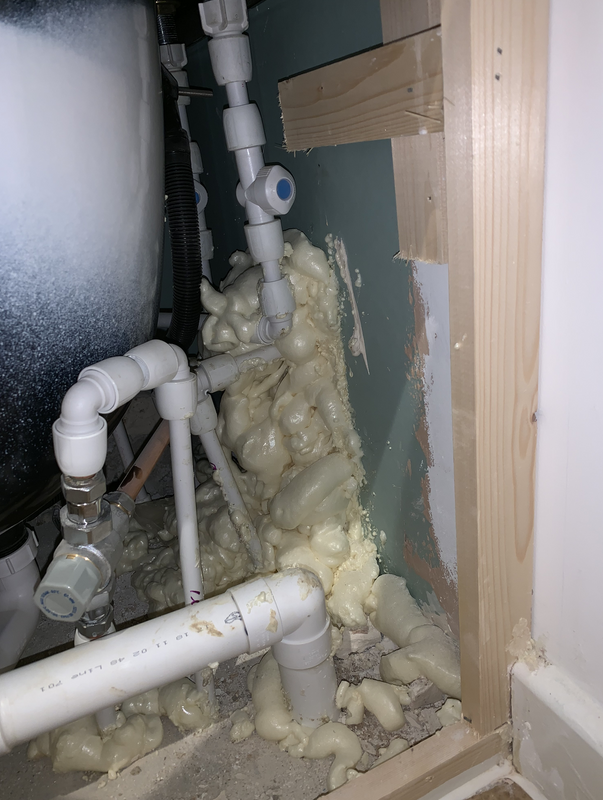 As for the rest of the pipework - sorry but it's appalling and god alone knows what all that expanded polyurethane foam is for. The expanding foam will be there as a draught/vermin barrier but c'mon, that's shocking, it looks like an apprentice was given that job and they've never used a foam gun before and then gone mad. The bath trap is as normal, as long as there's no damp patches below the trap or down the plasterboard at the points where the bath touches the wall, then smell won't be from there. "Vermin barrier"...what the fook are they expecting to try and gain entry? Jeeeze that is some use of expanding foam, makes me wonder what it is covering up? Regarding the pipe from the the bath trap (U bend) to the elbow on the right that shouldn`t rise (If that what the OP was talking about?). When I get back, I will try and put a pencil down and see what happens. Do you think it is worth me adding the excessive foam to my snagging list in case there is something behind it which is wrong? I have so many snagging issues now, one more won't hurt but don't want to waste peoples' time. seen that quality of work before,the plumber does the safety testing/technical documentation but the install work is actually done by multi trade labourers on very short term contracts. 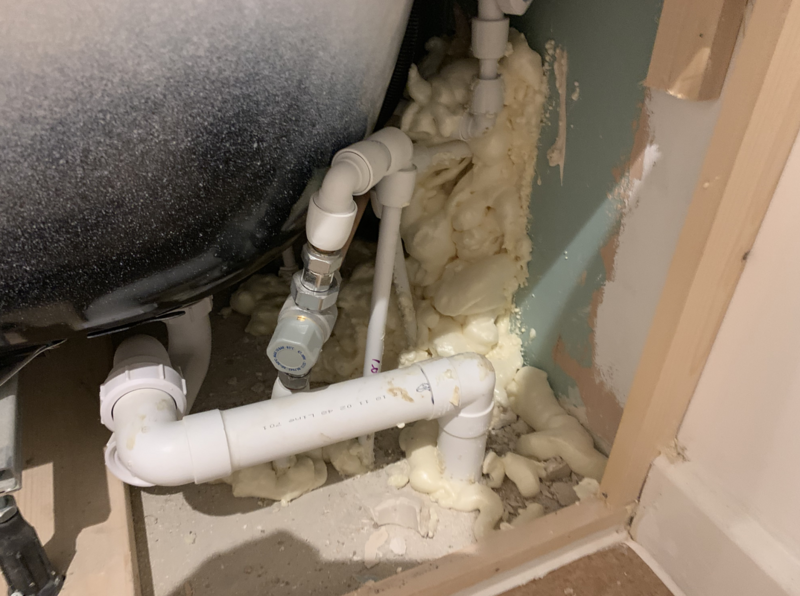 Would also be worth checking that the plastic hot and cold water pipes are safe with expanding foam. Hep2O pipe should not come into contact with the foam while the foam is liquid, don't know about other makes. The reason for the foam is the air leakage test. They test new houses for leakage so they have to seal up all holes on building fabric. That near-horizontal section before the elbow (where the drain drops vertically) might be causing problems if it is actually running uphill. Does the bath drain fairly quickly or is it a bit sluggish? Ahh shower. Do you get the same musty smell when using the bath? Is the pipework to the shower head concealed or is it just a flexi off the bath taps? Are the shower controls embedded in the wall? Have you tried the simple things like cleaning the plug-hole and u-trap etc? 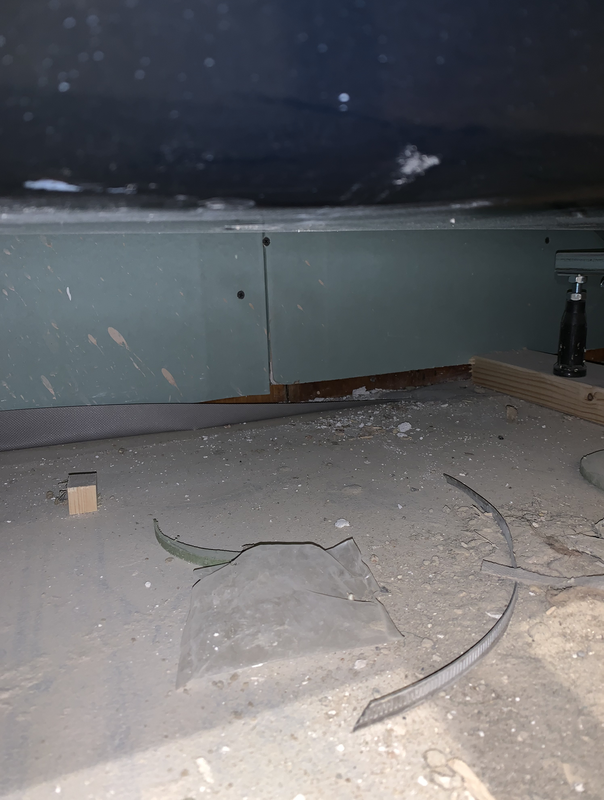 Even though you’ve only been in the house 6 months it’s surprising how much detritus can accumulate in the void just below the plug and into the u-trap in a short space of time. Perhaps you have an accumulation of detritus that is agitated by water flow and it’s releasing musty niffs. Our bath plug-hole seems to suffer the same problem that you describe on occasion,...especially if we’ve been away for a couple of days. It’s not a nauseating smell but it is very musty and unpleasant. ...sometimes if our household plug-holes haven’t been thoroughly cleaned for a while the amount of stuff that emerges can be surprising,...and thoroughly disgusting! Get your overflow, plug hole and u trap cleaned out,...you’ll feel better for it! If it doesn’t fix the problem at least you’ll have eliminated one possible culprit.